A helicopter pilot manipulates the helicopter flight controls to achieve and maintain controlled aerodynamic flight. Changes to the aircraft flight control system transmit mechanically to the rotor, producing aerodynamic effects on the rotor blades that make the helicopter move in a deliberate way. To tilt forward and back (pitch) or sideways (roll), requires that the controls alter the angle of attack of the main rotor blades cyclically during rotation, creating differing amounts of lift (force) at different points in the cycle. To increase or decrease overall lift requires that the controls alter the angle of attack for all blades collectively by equal amounts at the same time, resulting in ascent, descent, acceleration and deceleration. 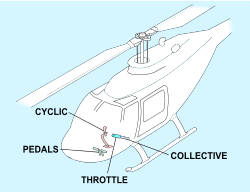 A typical helicopter has three flight control inputs—the cyclic stick, the collective lever, and the anti-torque pedals. Depending on the complexity of the helicopter, the cyclic and collective may be linked together by a mixing unit, a mechanical or hydraulic device that combines the inputs from both and then sends along the "mixed" input to the control surfaces to achieve the desired result. The manual throttle may also be considered a flight control because it is needed to maintain rotor speed on smaller helicopters without governors. The governors also help the pilot control the collective pitch on the helicopters main rotors, to keep a stable, more accurate flight. The cyclic control is usually located between the pilot's legs and is commonly called the cyclic stick or just cyclic. On most helicopters, the cyclic is similar in appearance to a joystick in a conventional aircraft. But on the Robinson R22, the cyclic is a central pillar that either pilot can manipulate. The control is called the cyclic because it changes the pitch angle of the rotor blades cyclically. That is, the pitch, or feathering angle, of the rotor blades changes depending upon their position as they rotate around the hub, so that all blades have the same incidence at the same point in the cycle. The change in cyclic pitch has the effect of changing the angle of attack, and thus the lift generated by a single blade as it moves around the rotor disk. This in turn causes the blades to fly up or down in sequence, depending on the changes in lift affecting each individual blade. The result is to tilt the rotor disk in a particular direction, resulting in the helicopter moving in that direction. If the pilot pushes the cyclic forward, the rotor disk tilts forward, and the rotor produces a thrust vector in the forward direction. If the pilot pushes the cyclic to the right, the rotor disk tilts to the right and produces thrust in that direction, causing the helicopter to move sideways in a hover or to roll into a right turn during forward flight, much as in a fixed wing aircraft. Any rotor system has a delay between the point in rotation where the controls introduce a change in pitch and the point where the desired change in the rotor blade's flight occurs. This difference is caused by phase lag, often confused with gyroscopic precession. A rotor is an oscillatory system that obeys the laws that govern vibration—which, depending on the rotor system, may resemble the behaviour of a gyroscope. The collective pitch control, or collective lever, is normally located on the left side of the pilot's seat with an adjustable friction control to prevent inadvertent movement. The collective changes the pitch angle of all the main rotor blades collectively (i.e., all at the same time) and independent of their position. Therefore, if a collective input is made, all the blades change equally, and as a result, the helicopter increases or decreases its total lift derived from the rotor. In level flight this would cause a climb or descent, while with the helicopter pitched forward an increase in total lift would produce an acceleration together with a given amount of ascent. The collective pitch control in a Boeing CH-47 Chinook is called a thrust control, but serves the same purpose, except that it controls two rotor systems, applying differential collective pitch. The anti-torque pedals are located in the same place as the rudder pedals in an airplane, and serve a similar purpose—they control the direction that the nose of the aircraft points. Applying the pedal in a given direction changes the tail rotor blade pitch, increasing or reducing tail rotor thrust and making the nose yaw in the direction of the applied pedal. Helicopter rotors are designed to operate at a specific rotational speed. The throttle controls the power of the engine, which is connected to the rotor by a transmission. The throttle setting must maintain enough engine power to keep the rotor speed within the limits where the rotor produces enough lift for flight. 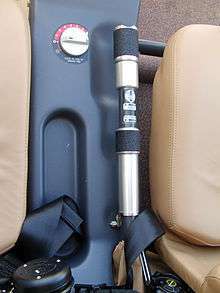 In many helicopters, the throttle control is a single or dual motorcycle-style twist grip mounted on the collective control (rotation is opposite of a motorcycle throttle), while some multi-engine helicopters have power levers. There are three basic flight conditions for a helicopter: hover, forward flight and autorotation. Some pilots consider hovering the most challenging aspect of helicopter flight. This is because helicopters are generally dynamically unstable, meaning that deviations from a given altitude are not corrected without pilot input. Thus, frequent control inputs and corrections must be made by the pilot to keep the helicopter at a desired location and altitude. The pilot's use of control inputs in a hover is as follows: the cyclic is used to eliminate drift in the horizontal plane, (e.g., forward, aft, and side to side motion); the collective is used to maintain desired altitude; and the tail rotor (or anti-torque system) pedals are used to control nose direction or heading. It is the interaction of these controls that can make learning to hover difficult, since often an adjustment in any one control requires the adjustment of the other two, necessitating pilot familiarity with the coupling of control inputs needed to produce smooth flight. In forward flight, a helicopter's flight controls behave more like those in a fixed-wing aircraft. Moving the cyclic forward makes the nose pitch down, thus losing altitude and increasing airspeed. Moving the cyclic back makes the nose pitch up, slowing the helicopter and making it climb. Increasing collective (power) while maintaining a constant airspeed induces a climb, while decreasing collective (power) makes the helicopter descend. Coordinating these two inputs, down collective plus aft (back) cyclic or up collective plus forward cyclic causes airspeed changes while maintaining a constant altitude. The pedals serve the same function in both a helicopter and an airplane, to maintain balanced flight. This is done by applying a pedal input in the direction necessary to center the ball in the turn and bank indicator. For helicopters with contra-rotating rotors—also known as Coaxial mounted—one over the other on the same rotor shaft (Like a Kamov KA-50), helicopter control requires interaction between the two rotors. However, a helicopter with tandem rotors—counter rotating rotors on different rotor masts (Like a Boeing CH-47 Chinook) uses differential collective pitch to change the pitch attitude of the aircraft. To pitch nose down and accelerate forward, the pilot decreases collective pitch on the front rotor and increases collective pitch on the rear rotor proportionally. Conversely, the synchropter and transverse-mounted rotor counter rotating rotorcraft have two large horizontal rotor assemblies mounted side by side, (like a Bell/Boeing V-22 tilt rotor) helicopters use differential collective pitch to affect the roll of the aircraft. All of these configurations use differential cyclic pitch to control movement about the yaw axis, tilting the rotors in opposite directions to cause the aircraft to spin in the direction of the tilted rotors. Flight Standards Service. Rotorcraft Flying Handbook: FAA Manual H-8083-21. Washington, DC: Flight Standards Service, Federal Aviation Administration, U.S. Dept. of Transportation, 2001. ISBN 1-56027-404-2.